Back in November, Busta Rhymes offered you all a chance to appear in the music video for "Why Stop Now," his latest single. Hundreds of you took up his challenge, downloaded the song, learned the verse, and filmed yourselves spitting it. Busta watched the entries, selected his favorites, and had director Hype Williams splice them into the final cut. We're happy to debut the results. Take a look, and see which fans did the verse nice enough to earn Busta's seal of approval. in 2012? Maybe you committed take your business to the next level this year, too. Keeping either resolution can be a challenge, so we wanted to call out a few YouTube fitness Channels doing great work both with their videos and their advertising—without breaking a sweat. Mike Chang has a growing following on YouTube thanks to his easy-to-do workout videos, steady stream of new content and special seasonal discounts offers on his Six Pack Shortcuts program. This January he gave YouTube subscribers 70 percent off from his new Insane Home Fat Loss program. He also uses YouTube TrueView video ads to reach new viewers, and now has more than 370,000 Channel subscribers interested in rock solid abs. The Flex Belt and TRX Channels use their YouTube Channels to host tons of video content for beginners and experts alike, many featuring celebrities like Next Top Model winner Adrianne Curry for Flex Belt or NFL superstar Drew Brees on the TRX Channel. Talk about motivation. Through the power of video, Flex Belt and TRX can capture an audience’s attention, show how their products work, and then tell viewers how to buy the product with banner ads on their brand Channels or call-to-action overlays over their videos. TRX’s YouTube Channel banner ended up being responsible for 7 percent of all holiday sales through paid search Channels in December 2011. If you’re a business owner, musician, filmmaker, fitness expert or all of the above, you can build an audience with YouTube video advertising tools by getting started with Google AdWords for video today. Did you vow to get in shape in 2012? Maybe you committed take your business to the next level this year, too. Keeping either resolution can be a challenge, so we wanted to call out a few YouTube fitness Channels doing great work both with their videos and their advertising—without breaking a sweat. with people across America over a live Google+ Hangout. This first-ever virtual interview will be streamed live on the White House YouTube Channel so you’ll have a front row seat. In the past week, over 225,000 of you have asked a question or cast a vote on the White House YouTube channel, voicing your interest in everything from military benefits to online poker, outsourcing to the Occupy movement. During today’s post-State of the Union interview, a selection of the top-voted YouTube questions will be asked, and several participants will actually join the President in the live Google+ Hangout to pose their questions directly. Tune in today to watch Your Interview with President Obama live at 2:30 p.m. PT on youtube.com/whitehouse and see how President Obama addresses the issues that you care about. You asked, and today President Obama will answer. This afternoon at 2:30 p.m. PT (5:30 pm ET), President Obama will head to the Roosevelt Room of the White House to connect face-to-face with people across America over a live Google+ Hangout. This first-ever virtual interview will be streamed live on the White House YouTube Channel so you’ll have a front row seat. We took in some dazzling videos of the Northern Lights captured on camera. We collected video from Egypt's one-year anniversary of its revolution. We examined how a certain very popular trend of 2012 has gone local. We checked in on the ever-growing popularity of dubstep. We were blown away by crazy footage of a California wind storm. Kevin Allocca, YouTube Trends Manager, recently watched "Ignition." The annual independent film extravaganza known as the Sundance Film Festival is underway in Park City, Utah. For film lovers who couldn’t make it this year to meet to-be-discovered filmmakers and rub shoulders with celebrities, we're bringing Sundance to you here on YouTube. Last year, we showcased past and present short films in the YouTube Screening Room. This year, we’ve teamed up with Sundance Film Institute to premiere a collection of films that are available for the first time for digital stream. Films include Obselidia (Independent Spirit Award Winner), Chasing Ghosts: Beyond the Arcade (2007 Sundance Film Festival documentary on the arcade gamer competitions in the ‘80s), New York Times Critic’s Pick Lord Byron and 1994 Sundance Film Festival Grand Jury Award Winner What Happened Was. To mark the last weekend of the festival, we’ll premiere Tim and Eric’s Billion Dollar Movie tomorrow at the same time the shock humor duo showcase their world premiere at the 2012 festival. This star-studded comedy features Zach Galifianakis, Will Ferrell, John C. Reilly and is already picking up buzz in Park City. For the best of Sundance and thousands of other titles, get more into movies at YouTube.com/Movies. Are you the next online beauty guru? is kicking off a search across the U.S. to find the next beauty guru on YouTube. One aspiring expert will win a spotlight on the Destination Beauty YouTube Channel and have their beauty tutorial video shown among 10 of YouTube’s most popular tutorial stars. This lucky beauty aficionado will also enjoy a trip for two to New York City for some pampering at L’Oréal USA and a year’s supply of L’Oréal Paris cosmetic, hair care, hair color and skincare products to support their “how-to” video efforts. If you think you have what it takes, sharpen your (eyeliner!) pencils and make sure your video is a cut above the rest. To get motivated, YouTube partner and beauty expert Kandee Johnson shares what you need to know about the contest. To enter, submit a tutorial video here that shares your “how-to” tips and tricks behind your favorite red carpet-inspired hair and makeup look. You can submit as many videos as you’d like, so explore a variety of trends and styles. Video submissions will be reviewed by a panel of judges measuring on the quality of instruction, production and end result, and full rules for the contest are here. Good luck and can’t wait to see all of your glamorous videos! Jamie Berkowitz, lifestyle program manager, recently watched "Make up look for the Office -Tuesday." L’Oreal Paris is kicking off a search across the U.S. to find the next beauty guru on YouTube. One aspiring expert will win a spotlight on the Destination Beauty YouTube Channel and have their beauty tutorial video shown among 10 of YouTube’s most popular tutorial stars. This lucky beauty aficionado will also enjoy a trip for two to New York City for some pampering at L’Oréal USA and a year’s supply of L’Oréal Paris cosmetic, hair care, hair color and skincare products to support their “how-to” video efforts. — where you decide the best commercial of the game. As the premier online gallery of Super Bowl commercials, YouTube Ad Blitz puts all the commercials in your hands, letting you view and vote on the top ads of the Super Bowl, whether you’re on a computer, mobile phone or tablet. This year, NBC Sports is the official partner for YouTube Ad Blitz, adding online promotion to its Super Bowl coverage. The Ad Blitz gallery will be hosted on NBCSports.com and the YouTube Ad Blitz Channel, where you can watch your favorite commercials after they’ve aired on NBC. Voting begins after the final whistle and will continue until Midnight ET on February 13. We’ll also host a Google+ Hangout after the game where you can chat face-to-face with an NBC celebrity. Stay tuned to our blog for details. Let the ad game begin! Super Bowl XLVI will be one of the biggest moments of the year for advertisers, commanding the attention of millions of Americans tuned in to watch the game. After the big plays on the field, you can join in on the action online with YouTube Ad Blitz — where you decide the best commercial of the game. If you could hang out with President Obama, what would you ask him? Would your question be about jobs or unemployment? The threat of nuclear weapons? Immigration reform? Whatever your question is, submit it on YouTube for the opportunity to ask the President directly in a special interview over a Google+ Hangout from the White House. So take out your camera, check your hair and go to youtube.com/whitehouse to submit your question now. Need ideas? Visit youtube.com/whitehouse on Tuesday night to watch the President’s State of the Union address live. The address will be followed by the Republican response on Speaker Boehner’s YouTube channel. Video questions are preferred (though we also accept text) and should be about 20 seconds long. In the video description, be sure to tell us a little bit about yourself, like where you’re from. Your Interview with President Obama will be streamed live at 5:30 p.m. ET on January 30 on youtube.com/whitehouse. You have until midnight ET on January 28 to submit your question and make your voice heard on the issues that matter to you. A New Homepage and Design: Launched in December to help you to get more into the great content you love, with a customizable YouTube Channels line-up and feed of the latest activity and videos from your subscriptions. YouTube Original Channels: Original Channels from well-known personalities from the TV, film, news, sports and other fields, to up-and-coming media companies, to some of YouTube’s existing partners. Full line-up here. YouTube Politics: As we’re now in an election year in the United States, this Channel is your one-stop-shop to follow the latest political stories, connect with the candidates and keep your finger on the political pulse of the nation. YouTube Rentals: From new releases to all-time classics, thousands of full-length films from major Hollywood studios are available to rent in the US, UK, Canada and Japan at youtube.com/movies. YouTube Slam: Born on TestTube, this video discovery experiment was cooked up with folks from Google Research. Each week a new crop of videos battles head-to-head in Comedy, Cute, Music, Bizarre and Dance Slams, where your votes determine who wins the Slam and gets featured on the leaderboard. YouTube Editor: The Editor team was busy in 2011, launching image stabilization for smoother videos, the Edit Video button for one-click video editing and enhancements, and including Creative Commons licenses building a library of millions of CC tagged videos. YouTube Analytics: We love data, so we added even more features to help you examine and grow your audience through more detailed reporting. 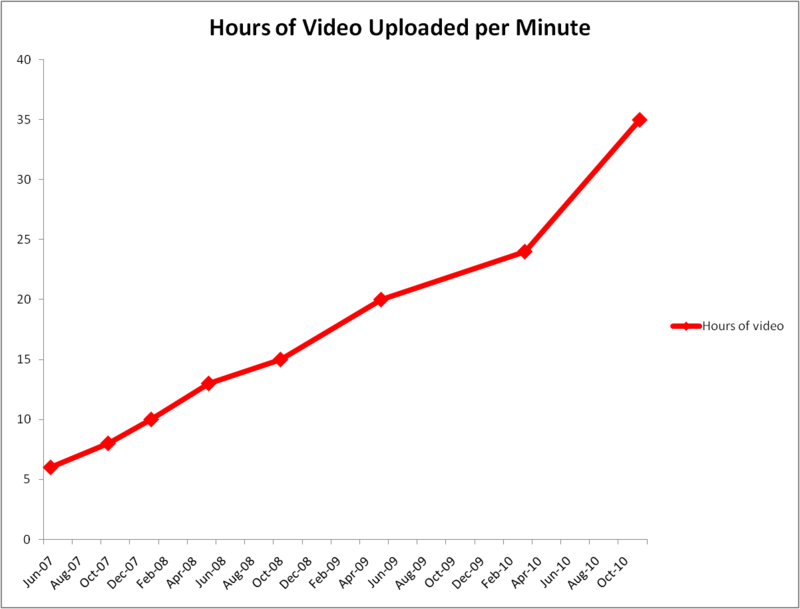 More opportunities to make money from videos: We're also helping more uploaders make money from their videos. You might have noticed a button saying "Make money on your videos" last time you logged in to your YouTube account, which you might see if your account is in good standing and you’ve been adhering to our Community Guidelines. If you opt in, ads might run on your videos and you could start earning revenue. We've made this feature available to many account holders in the U.S. already, and over the coming months we'll be making it available to more people around the world. YouTube.com/Create: No camera? No problem. With partners like Magisto, Vlix, GoAnimate and others, you can still create animated and personal videos to upload directly to YouTube. With new features coming out every week, these examples are just a few of the launches in 2011. So, we also want to hear from you. What was your favorite YouTube product launch of 2011? Let us know by leaving a comment on the +YouTube page. If you add the Channel to your homepage guide you’ll regularly get exclusive commentary and personal insight into Tiësto’s life and work, venues around the world, festival life on and off-stage, and more clubbing than you could ever fit into just one night. New episodes kickoff today on Tiësto’s YouTube Channel, with more coming every week. And remember you can get into even more great electronic and other music on YouTube Music, with new tunes every Tuesday. If you want to get even more excitement from the NFL Playoffs, check out YouTube's new Ad Blitz Pre-Game program, sharing news coverage, party tips and videos from YouTube partners and sponsor Dodge Durango. The Pre-Game program is the warm-up for our annual Super Bowl Ad Blitz advertising extravaganza, which kicks off February 5. If you’re looking for a place to call home over the NFL Playoffs, stop by Ad Blitz Pre-Game and enjoy the YouTube Channels getting you ready for kickoff! Mark Day, program manager, recently watched "The Topic: NFL Playoff Predictions, Week Two." in 2007 to help organizations take their work to the next level, and since then, more than 16,000 nonprofits have joined the program. There are hundreds of nonprofit organizations with millions of views on YouTube, and dozens with more than ten million views, like Greenpeace, Khan Academy and UNICEF. We’ve made a couple of updates to the program that we hope will help nonprofits use video in new and compelling ways. The Playbook Guide: YouTube for Good. This is a how-to resource specifically targeted at nonprofit organizations, with sections on how to create content, raise funds, connect with other community members and more. Improved features. As part of our new Channels design, we’ve made the donate button on nonprofit channels even more prominent, making it easier than ever to support the causes you care about. If you’re a YouTube Nonprofit Program with other ideas about how we can make the program better, tell us your suggestions in the comments below! If you’re a nonprofit in the U.S., U.K., Canada or Australia and not yet a member, visit www.youtube.com/nonprofits to learn more and apply. Nonprofits are an important part of the YouTube community, and their videos have educated and inspired audiences since the early days of the site. We launched the YouTube Nonprofit Program in 2007 to help organizations take their work to the next level, and since then, more than 16,000 nonprofits have joined the program. There are hundreds of nonprofit organizations with millions of views on YouTube, and dozens with more than ten million views, like Greenpeace, Khan Academy and UNICEF. Alli Sports: Whether you want tips from your favorite athlete on how to pull off their signature trick, a behind the curtain look into the lives of the biggest and fastest rising stars in the sports, or news and highlights from the industries most insightful analysts, The Alli Show, Step by Step, Inside AlliSports, AWSM on Alli and Frends Crew, are just a few of the shows on Alli Sports that will keep you up to speed on the latest and greatest moves and news in the industry. Network A: Network A features some of the most amazing performances and personalities in the history of action sports. Want to see the best tricks and segments from some of the best athletes and filmmakers from around the world? You've come to the right place. In the coming weeks, new shows, new Channels, and an unprecedented level of access to action sports pros will be added. Stay tuned! Red Bull: The Red Bull Channel is bringing 13 new original episodic series that will chronicle the competition and daily lives of the world’s best action sports athletes including urban mountain biker and YouTube celebrity, Danny MacAskill, skateboarding pro Ryan Sheckler, action sports phenom Travis Pastrana and big wave surfer Jamie O’Brien. You’ll also be able to find new episodes of other popular series starting with the first episode of Livin’ Louie Vito that explores the life of professional snowboarder Louie Vito. RIDE: Brought to you by Tony Hawk, RIDE is a 24-hour Channel devoted to the skateboarding lifestyle that will feature Hawk, Skatepark of Tampa, Jamie Thomas and Lance Krall among others. On “Tony Hawk’s Dissent,” subscribers will have behind-the-scenes access as Tony hangs out with different celebrities. Viewers can also get into the game with shows like “Shredit Cards,” where skaters upload their own skate videos and earn shopping passes based on the degree of difficulty and “One in a Million,” where amateur skateboarders will compete to become sponsored. Because it’s YouTube, you can program a lineup of your favorite action sports Channels — that way you won’t miss a trick, highlight or interview. Just subscribe to the Channels you like, and get the latest episodes delivered right to your YouTube homepage. Tell us what Channels you’ll be dropping into your YouTube guide in the comments below! , I talked about how the web is creating exciting opportunities for all of us in online video, and how YouTube is proving that producers, curators, advertisers and viewers can all thrive in this rapidly growing ecosystem. While you’re collectively watching 3 billion hours of video a month already, we’re just scratching the surface of the amazing possibilities for countless new Channels, aiming to map the interests of all people in this world. Look forward to the world where you will have channels for all of your interests, small or big. It’s a great time for video on the web, and we hope you’re as excited as we are for what’s ahead. Come and play with us. In order to fully appreciate how exciting today and tomorrow are for our viewers, one needs to look back to the 1980s when we went from four broadcast channels to hundreds of Channels through cable and satellite TV, expanding the choices available and, as a result, viewership. Today, the web may be to cable TV what cable was to broadcast TV — a way to excite and engage viewers even more. At CES 2012, I talked about how the web is creating exciting opportunities for all of us in online video, and how YouTube is proving that producers, curators, advertisers and viewers can all thrive in this rapidly growing ecosystem. While you’re collectively watching 3 billion hours of video a month already, we’re just scratching the surface of the amazing possibilities for countless new Channels, aiming to map the interests of all people in this world. Look forward to the world where you will have channels for all of your interests, small or big. to design a science experiment that could be performed by NASA aboard the International Space Station, something that has traditionally been the preserve of qualified astronauts and scientists. Coming up with a suitable idea required huge imagination, passion and scientific curiosity, which is why we were thrilled with your response—we received a total of 2,000 video submissions from students in more than 80 countries! Expert scientists helped us check and rank all of the entries, and today we are very proud to announce the sixty finalists. All of their submissions can now be viewed on the YouTube.com/SpaceLab Channel, and from January 17–24, you can vote for the ones you want to win. We need your help selecting the six regional winners, and ultimately the two global winners that will have their experiments performed 250 miles above Earth and live streamed on YouTube. Start voting today. Remember, the channel is also a launchpad to some of the best space and science videos on YouTube. We’ve already received more than 39 million combined video views worldwide and we’re adding new videos and playlists regularly, like this new playlist about the mysteries of the Red Planet. Subscribe to the channel to keep up to date with all the latest content. Didn’t make it to the final round? Check out the newly launched Google Science Fair 2012 for another chance to enter an amazing global science competition. International soccer phenom +David Beckham is taking off his boots and heading to Google for an exclusive live interview. Have a question you’ve been dying to personally ask Becks? Post it on Google+ with hashtag #GoogleBeckham, and maybe he’ll answer it live! Watch the interview on Thursday, January 19 at 9am PT on youtube.com/atgoogletalks. And as an added bonus, hangout with him directly afterward on his Google+ profile at 10:30am PT. Add him to your circles now for all the latest updates. Andrew Schulte, Google Product Marketing Manager, recently watched, "All the FreeKicks from David Beckham." Tennis Australia is making the series more accessible than ever before by offering full-length match replays, as well as loads of training footage and player interviews. There will be a slew of of on-demand footage from the full Australian Open Series, including the Brisbane International , Sydney International, Hobart International and the Adelaide World Tennis Challenge. This will include match highlights, player press conferences, and perhaps — a few shirtless training sessions. Richard North, YouTube Partner Manager, recently watched "Shaark!" The Australian Open Series is in full swing, and tennis fans around the world can catch loads of the action this year on YouTube. Tennis Australia is making the series more accessible than ever before by offering full-length match replays, as well as loads of training footage and player interviews. Music Tuesday: The Little Willies, David Bowie and more! Coachella and Lollapalooza festivals, and a barnstorming year-end with Brit-rockers Kasabian live from London on New Years Eve. We also handed our homepage over to a host of musicians, resulting in enlightening curations from the likes of Red Hot Chili Peppers, My Morning Jacket and tUnE-yArDs’s Merill Garbus. And if that’s not enough, we even let down the drawbridge to the YouTube castle, and welcomed in a fine selection of performers to take part in our YouTube Presents series. Check out Florence Welch, Common, and Panic! At the Disco at our YouTube HQ! With even more to come in 2012, you can stay up-to-date with the latest on our music homepage. Norah Jones’s output has always crossed genres, from jazz to soul to pop. Since 2006 she has also explored a passionate interest in country music, with her side project The Little Willies. Six years after their first release, Norah and Co are back with For The Good Times, putting a twist on 12 country standards, including a standout rendition of Dolly Parton’s Jolene. To celebrate the release, the band spent some time at the Country Music Hall of Fame in Nashville to select some of their favorite country YouTube videos. Few careers can compare to Bowie’s, both in terms of individual success and influence on pop culture as a whole. And while it’s hard to believe Ziggy Stardust hit 65 this week, even the briefest rummage through the YouTube vaults reveals dozens of gems from down the years, such as the music video for Ashes to Ashes, or this 1973 BBC performance of Jean Genie. To celebrate Mr Bowie’s big day, we’ve put together a playlist of some of his many collaborations with other artists, including Annie Lennox, Arcade Fire and even Bing Crosby. Tim Partridge, YouTube Music Manager recently watched "Oh Girl." Last year was a stellar year for music here on YouTube, with live streams of Coachella and Lollapalooza festivals, and a barnstorming year-end with Brit-rockers Kasabian live from London on New Years Eve. We also handed our homepage over to a host of musicians, resulting in enlightening curations from the likes of Red Hot Chili Peppers, My Morning Jacket and tUnE-yArDs’s Merill Garbus. And if that’s not enough, we even let down the drawbridge to the YouTube castle, and welcomed in a fine selection of performers to take part in our YouTube Presents series. Check out Florence Welch, Common, and Panic! At the Disco at our YouTube HQ! year YouTube announced a new opportunity for thousands of music publishers - and the millions of songwriters they represent - to make money from the use of their music in YouTube videos uploaded by fans. This was a result of an agreement with two leading U.S. representatives of music publishers: the National Music Publishers Association (NMPA) and its subsidiary the Harry Fox Agency (HFA). Through this agreement, music publishers (both HFA and non-HFA members) and songwriters have the opportunity to license the musical compositions they represent for use by the YouTube community. Our Content ID system, with input from our partners, allows us to identify these works among the hundreds of millions of videos on YouTube, whether the compositions appear in an original sound recording, or in a cover version uploaded by a fan. When a publisher allows YouTube to run ads alongside videos that incorporate its compositions, the publisher, and its songwriters, will be able to share in the revenue that the YouTube community’s creativity yields. Music publishers should review and sign-up for this opportunity by January 16, 2011. Information can be found at www.youtubelicenseoffer.com, and music publishers can opt-in through this website using the claim and control numbers provided in the materials sent last summer. Additional information is available by calling: 1 (888) 430-7225. By opting-in this week, music publishers will be creating a new and future revenue partnership, empowering both their fans’ creativity and their own musical endeavors. Join us. YouTube has become a thriving music ecosystem of emerging and established artists, where original music and creative covers can reach an audience of millions. We want to continue to recognize songwriters for their artistic contribution to this community. To this end, last year YouTube announced a new opportunity for thousands of music publishers - and the millions of songwriters they represent - to make money from the use of their music in YouTube videos uploaded by fans. This was a result of an agreement with two leading U.S. representatives of music publishers: the National Music Publishers Association (NMPA) and its subsidiary the Harry Fox Agency (HFA).